Fès has hotels to suit every pocket and taste. 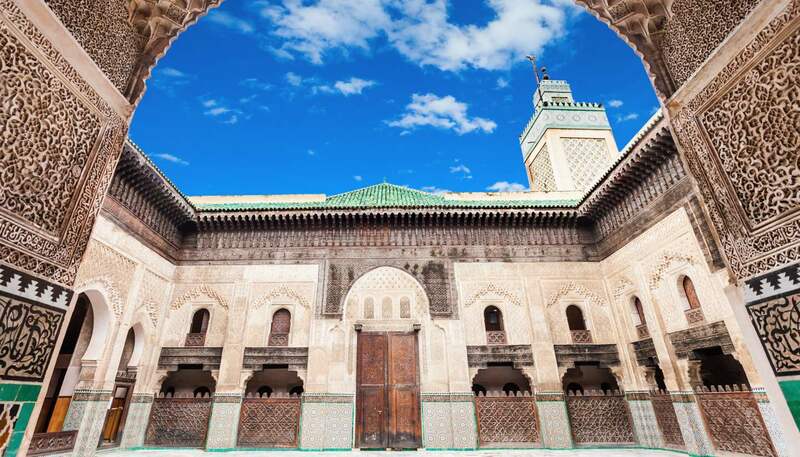 One of the best ways to soak up the city’s atmosphere is to stay in a riad, a traditional medina house with rooms based around a central courtyard. These beautifully restored old residences offer boutique-hotel style accommodations with personal service and authentic home-cooked food. These rates are based on double occupancy of twin or double room at standard rate, including breakfast for two and taxes. Live in the lap of luxury at this spa-resort in the southern end of the medina. The generously sized pool, spa and hammam here are all pampering, rejuvenating treats after old city explorations and long travel days. Large rooms are regally outfitted with traditional Moroccan flourishes but also come with all mod cons. This sumptuous property offers rooms and suites with traditional furnishings, zellig floors, plaster-decorated walls, and exquisite Moroccan fabrics. There is an amazing rooftop bar, plunge pool, restaurant and spa plus fabulous views of the medina and Atlas Mountains. This is a fantastic place to envelop yourself in old world opulence. This elegantly restored, traditional 19th century medina mansion allows you to sleep amid opulence fit for a pasha. The rooms are scattered across four interconnecting courtyards and boast four-poster beds, antiques, and mashrabiyya (lattice-screens) details, as well as painted cedar-wood features and zellig tiling in abundance: a vision of palatial luxury. This charming old medina riad has bags of traditional appeal, with painted-wood ceilings, original zellig tilework and antiques, and Berber textiles scattered throughout. There are just four rooms here so expect fabulously personal service from staff. The dinners, made from seasonal local produce, are not to be missed. A ten-minute walk from the main door of the medina, this guesthouse is a step outside the central hustle and bustle, but the charm of the architecture, gardens, and home-cooked food make a stay well worth it. 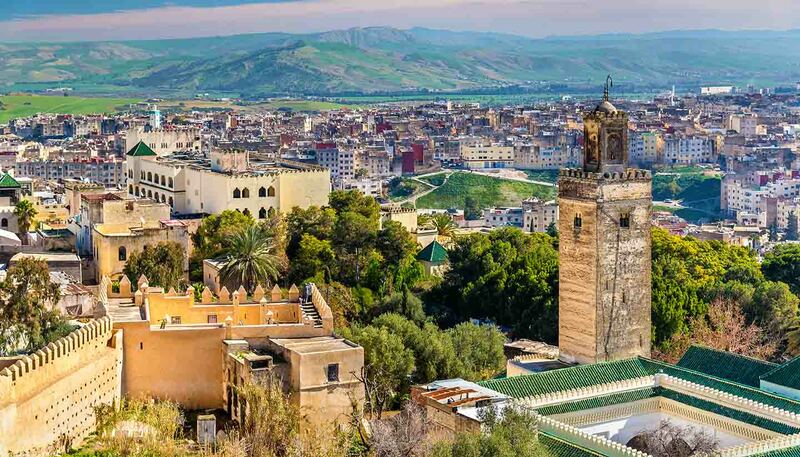 The hotel staff are eager to make travellers comfortable and help them navigate Fes—and is always ready to share their tasty mint tea and cookies. Moroccan craftsmanship meets minimalist contemporary styling at Dar Finn, where the light-filled rooms come with stained glass windows, gorgeous original tile floors, and dinky balconies overlooking the internal courtyard. A rooftop bar, plunge pool and shaded garden make this riad an oasis within the medina. This gorgeously restored riad in the center of the medina offers luxury and charm at a fair price. Rooms are individualised and elegantly decorated, and the food is a must-try. Head up to the rooftop patio for a beautiful view. Behind high walls and a discrete doorway in the oldest part of the medina is Dar Seffarine, a beautifully renovated 750-year-old riad that has been restored to its former glory. Guests here are treated like long-lost friends by the sociable owners, who host evening drinks and organise nightly dinners. This inviting and cosy riad offers homely touches such as coffee delivered to your door each morning and breakfast served at any time of the day. There’s a large roof terrace to slouch out on after exploring the dusty souks and the staff go out of their way to help.